Database backup is one the regular activity a DBA would perform. Some times you might come across a situation where in you need to backup the database to different location. When I say backup database to different locations, it means that a copy of backup file needs to be placed on a different location as well and this is different from the Split Backups. Using the option "MIRROR TO" is very simple, you just need to mention "MIRROR TO" and "WITH FORMAT" options in the normal BACKUP DATABASE Statement and you are done. The backup database statement with these two options will take the backup of the same database to multiple locations at the same time. This option "MIRROR TO" is introduced in SQL Server 2005 and this works only in SQL Server 2005 Enterprise Edition and later versions. This can be used for all backup types and the Maximum number of "MIRROR TO" clauses that you can specify is three. When it comes to restoring the database, we can use either of the backup copies to restore or recover the database. In one of my previous post "List of SQL Server instances currently installed in your network", I explained how to get the list of SQL server instances installed in your network. Sometimes you might require an SQL Server instance to be not exposed to others due to some security reason. 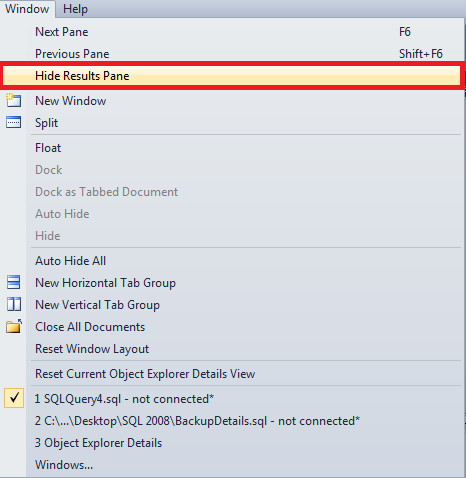 This can be done by using the "Hide" option available for an SQL Server instance. Go to "SQL Server Configuration Manager"
In the Left Pane Expand "SQL Server Network Configuration"
Now Right Click on "Protocols for <ServerName>" and go to Properties for the server you need to hide. 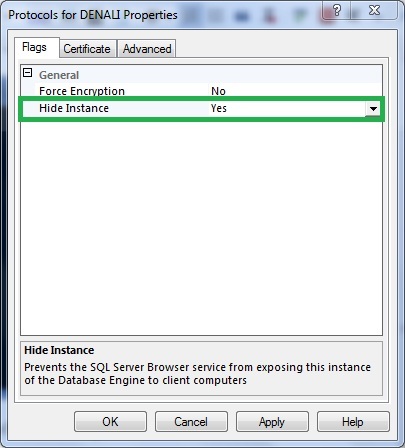 In the "Flags" Tab, change the option to "Yes" for "Hide Instance"
Now re-start the SQL Server Service for this Instance and you are done. This instance from now will be hidden. This stored procedure give you the information about latest backups happened on all databases in a server. This SP works for SQL server 2005 and up. Recently I installed Denali CTP 3 version and was writing a code which is coming next in this blog. During that time I attempted to hide the results pane using the keyboard shortcut Ctrl+R and was surprised that the keyboard shortcut Ctrl+R was not working. When I investigated further I found that that the keyboard shortcut was not assigned to the command "Hide Results Pane". 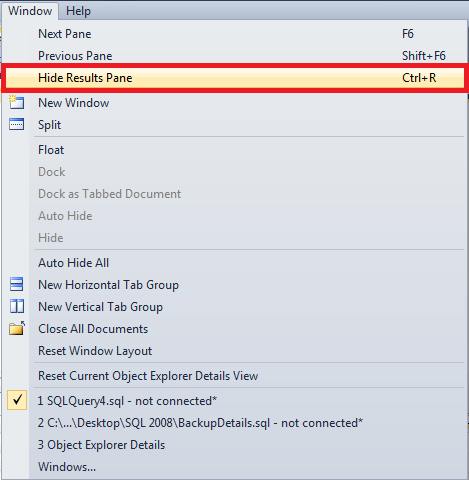 To fix this issue or to assign the keyboard shortcut to the command "Hide Results Pane", follow the below steps. In a SSMS window, go to "Tools" menu and choose "Options". In the left pane of "Options" window, expand "Environment" and then click on "Keyboard". Now, Under "Shortcuts for selected command:" section choose "SQL Query Editor" from the dropdown list of "Use new shortcut in:" sub-section. In the "Press shortcut keys:" sub-section place the cursor and press the keys "Ctrl" followed by "R"
Click on "Assign" button and click "OK" to exit the "Options" menu and start using the keyboard shortcut "Ctrl+R" to Hide\Show Results Pane.